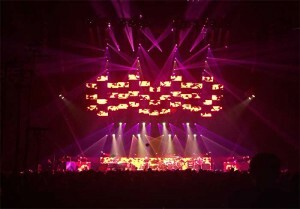 Phish’s creative team consists of production manager, Jesse Sandler, longtime lighting designer Chris Kuroda (also known as the fifth band member), and Abigail Rosen Holmes , fellow co-designer with Kuroda, who collectively recruited long time Phish client, TAIT, to build and engineer the massive, custom-designed LED video structure. As well-documented throughout their long musical career, Phish’s dedicated fan base appreciates the energetic jam sessions, funk experience and escalating surprise gags that have been remiss in video and automation. 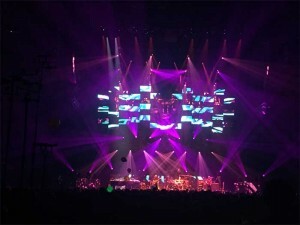 But, with Kuroda’s innovative instincts and use of non-traditional video technology comes a happy medium between a fresh new visual and intergalactic experience. Think “space invader” meets “Andy Warhol”. TAIT manufactured an LED video structure, made of 78 individual LED video screens, designed to appear as one large panel that is 5.6ft. tall x 51.2ft. wide. During the second set, the one large panel, separates into numerous smaller screens hanging at approximately 22ft. above stage level. During the entire show, the artwork displayed on the screens, via projection, includes flashing, abstract colours and 'pop art'-like content. Operated on TAIT Navigator, the LED video structure uses ten hoists to lift it above stage level. TAIT also provided a NavHoist lighting package including 36 additional hoists to automate the tours lighting rigs, also controlled by TAIT Navigator. 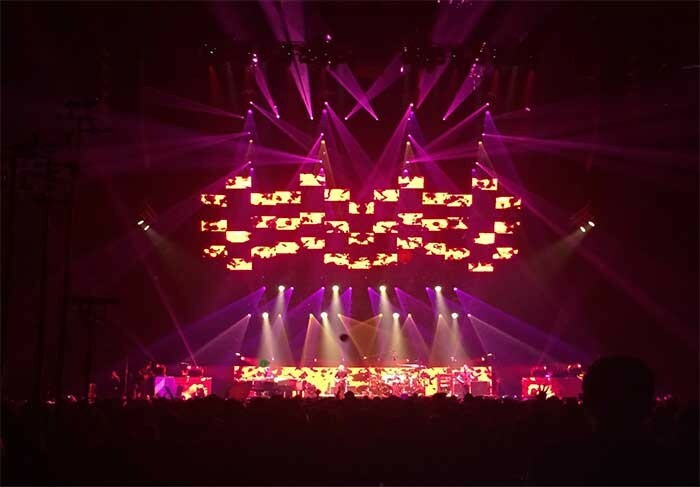 TAIT’s dynamic video structure pushes the limits of innovation in a concert setting by taking an artistic approach to video technology and creating an LED moving video structure that amplifies the crowds jam experience. Phish’s next stop on their summer tour is at Wrigley Stadium in Chicago, Illinois on Friday, June 24th, 2016. The jam band will be travelling throughout the United States until the beginning of September. photo: AndrewWallace, technical lead, TAIT.